Its a new release book by Maria Shell. If you don't know Maria sit back and have a read as she is an artist full of ideas, integrity and original thought. Have a look at this cover! For starters, lets consider the meaning of Improvisation which is spontaneous creation sometimes without preparation from whatever tools or materials are available at the time. Hmmm, there's a lot of meaning in those words. First of all spontaneous creation without preparation does not necessarily mean without intent. Intent is a valuable part of improvisation. We may not be doing a lot of drafting, crunching numbers or designing layout to get where we want to go but the destination has implied direction. Going in a direction with no meaning can leave us wondering why. Secondly, random selection of fabrics can leave us feeling a bit disconnected. A thoughtful gathering of materials considering value, hue, tint, shade and pattern adds to the integrity of the finished result. 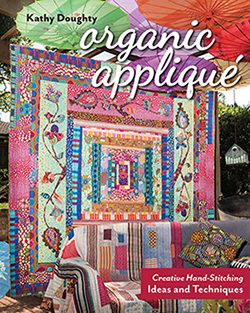 This book lays out a path of cookie crumb delights toward successful quilts that engage the viewer and leave us wanting more! When Maria Shell turns her hand to improv something amazing happens. The lines and shapes created define intent, direction, shape and content just be the intensity of pattern created. Improv at its best engages us as the spectator of a quilted creation and leaves us begging for more. Improv that creates a pattern is way more than meaningless meandering. Imagine my excitement when I found this Big Rad Plaid.....as the believer that plaid is the new black this one really sent me into orbit. Or as a lover of stripes this one appeals to me! As a shop owner I am drawn to subjects that offer more than simple patterns and this book is rich in content.In a world inundated with product, it is nice to find something to sink the mind into and this book delivers everything it promises from first glance through last word. There is so much to explore that my first inclination is to plan classes using this book as a guide to creative assembly. 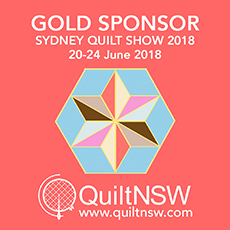 Like minded quilters looking to explore creatively together will enjoy working through the exercises and discussing the variety of ideas presented. 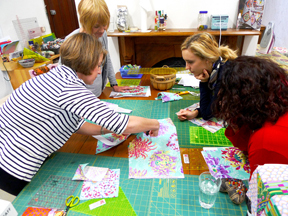 In a group we could watch the spontaneous development of palettes and patterns and learn in groups at warp speed. Maria Shell has great focus, long lasting attention to detail and a superb color sense which is evident on every page of this book. Last July I met Maria when we were room mates at Quilting by the Lake. To be honest, although I had heard her name she wasn't on my radar despite her 2015 Quilt National win. It didn't take me long to feel a kindred spirit with a self taught quilter that forged a creative life with a young family isolated from all things familiar. My experience was in Australia and Maria's in Alaska. Maria's perfected the art of working with color and is evidence that working with Nancy Crow helps to clarify and define one's own true instincts. If you like a book just to look at the pictures there are plenty of interesting ideas presented here. If you like more than that, the instructions and ideas are well set out and easy to follow which always a bonus. Like so many of the C&T Publishing books, this one has an easy to follow presentation that makes using the book as an individual or as a teaching tool super easy. Full of great content this book is a must on the shelf in my shop and in my personal library. Sometimes getting started is the hardest part. Follow the guidelines for studio set up, thinking about color and necessary tools and it would be hard not to jump right in and get started with an improv project of your own! One step at a time, the projects start simple and add intensity which means that beginner or experienced quilters will find joy in these pages. 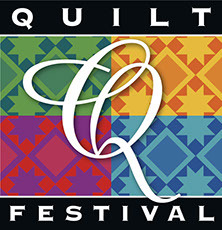 If you are a shop you can purchase the book at C&T publishing < http://www.ctpub.com/improv-patchwork/> or for your personal use request it at your local quilt shop or find it on line. If you are reading this now you can WIN WIN WIN a copy of the book (hard copy for USA, digital for all other countries) by posting a comment at the end of your blog post. The winner will be selected by midnight Alaska Time on October 26. Be in it to win it...I think I'll make the first comment!! We are waiting for this book to arrive in our shop. If you are interested in doing a class at Material Obsession next year let me know by commenting here and we'll see if we have a winner!